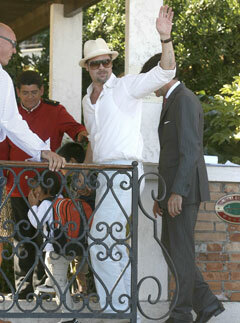 Brad Pitt has arrived in Italy with his family brood in tow to attend the 65th Venice Film Festival. Hollywood is officially descending on the Italian city this week with Tinseltown’s big hitters, Brad Pitt and George Clooney jetting in yesterday to start the proceedings. Pitt was spotted with sons Pax and Maddox yesterday taking to the canals for a boat trip with his family. Last night saw best friends Clooney and Pitt host a glittering charity fundraising dinner to begin the week’s festivities. The party was held in aid of the charity the two actors and colleagues from the Ocean’s Thirteen movie set up called Not On Our Watch, which aims to aid areas hit by disaster in the developing world. The charity has raised £3.8 million to date for victims in the Darfur region of Sudan, as well as those hit by the cyclone in Myanmar. Pitt and Clooney are set to make a second appearance on the red carpet at the film festival tomorrow night for the opening of the latest Coen brothers movie Burn After Reading, in which both actors star. The rest of the week will be awash with celebrities showcasing many of next year’s big movies. Charlize Theron, Kim Basinger, Anne Hathaway, Tilda Swinton and John Malkovich are all expected to make appearances, so check back here for all the pictures from the summer’s biggeset film festival.